South African state prosecutors on Tuesday argued in court for Oscar Pistorius to be convicted of murder and sent back to jail, two weeks after he was released on house arrest. The disgraced Paralympic sprinter was found guilty in 2014 of culpable homicide - a charge equivalent to manslaughter - after shooting dead his girlfriend Reeva Steenkamp on Valentine's Day in 2013. At the Supreme Court of Appeal in Bloemfontein, state prosecutors tried to convince judges that Pistorius should be found guilty of murder and sentenced to a minimum of 15 years in prison. 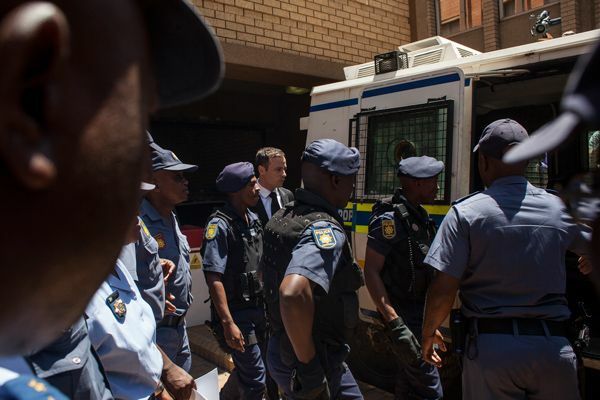 He was released on October 19 - just one year into his five-year jail term - to spend the remainder of his sentence at his uncle's mansion in Pretoria. Pistorius, 28, said he thought there was an intruder in his house when he blasted four bullets through the bathroom door of his bedroom, killing Steenkamp, a model and law graduate. Prosecutor Gerrie Nel began his case, arguing that Pistorius intentionally meant to kill whoever was behind the door. The state lawyers have described the sentence as "shockingly light, inappropriate" and said, "not enough emphasis was placed on the horrendous manner" in which Steenkamp died. A panel of five judges will hear the arguments from the state and defence, with the proceedings scheduled to last one day. The judges are then expected to announce a future date to deliver their ruling. "I'm here to support Gerrie Nel and the team," said Reeva's mother June Steenkamp, sitting in court. "We are saying he must stay in jail," said Khosi Mojapi, a 33-year-old member of the African National Congress Women's League, outside the court building. "As women, we need to make sure the law is behind us. We say stop abusing women." A lone Pistorius supporter held a sign reading "Hands off Oscar Pistorius, Give Oscar Pistorius a break." "We need to ensure everybody gets a second chance at life," said Tokelo Africa, wearing a white fedora and navy suit.